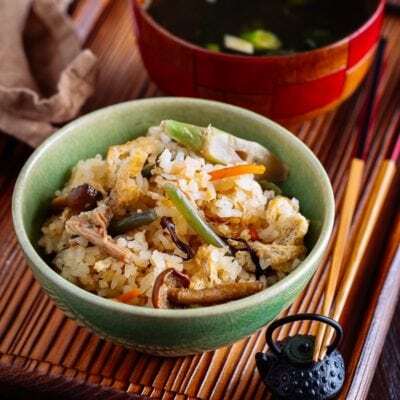 Start your week with this delicious Japanese comfort rice dish, Niratama donburi. Soft fluffy egg stir fry with Chinese chive served over white rice. Easy & fuss-free! Mondays are short days for my children. I go pick them up from school at 12:30 pm and come straight home. While they are changing out of their uniforms, I usually make some quick lunch for us if we don’t have any leftover from previous night’s dinner. For a while, their favorite was this quick dish called Niratama Donburi (ニラ玉丼ぶり), or Egg with Garlic Chives Over Rice. Niratama literally means garlic chives (nira) and egg (tama shorten for tamago). Sometimes we add a little bit of thinly sliced pork (buta) and that’s called Buta Niratama (豚ニラ玉). Eggs and garlic chives are cooked on high heat till fluffy outside and still soft inside. 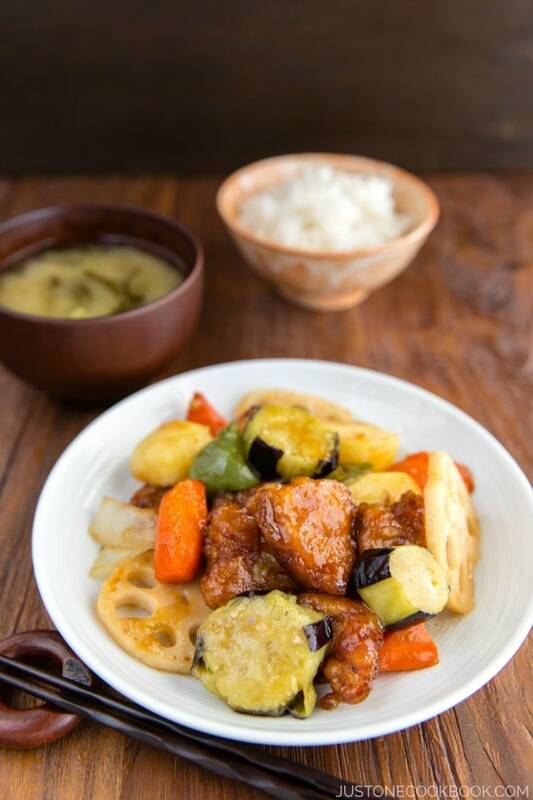 We like to eat it as a single main dish, so we serve it over steamed rice. 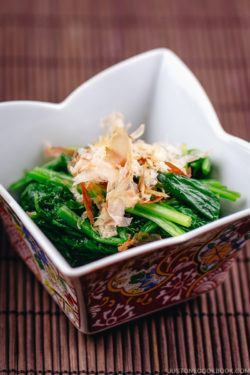 The chives I use for this dish are garlic chives (or sometimes called Chinese/Asian chives) and different from the chives used as herbs in Western cuisines. I don’t quite know how to explain the flavor, but this simple one bowl rice dish is really, really delicious. The first time I made this for my husband, he had a strange look on his face. When I told him the dish I was making, he didn’t believe the combination would work, and definitely thought it would not taste good. 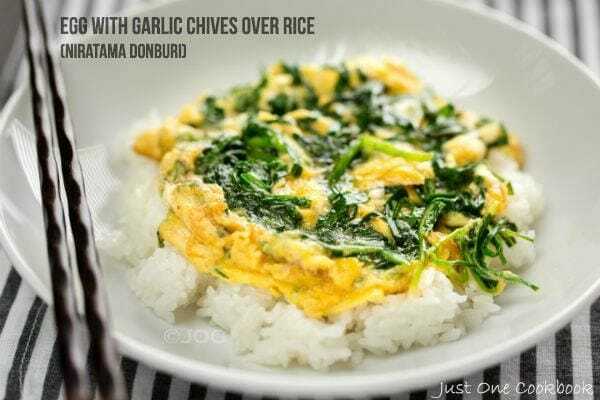 After the first bite, his eye sparkled and said, “wow, the flavor is so unexpected and so good, can you please make this more often?” The gentle hint of garlic chive mixed with the fluffy egg and rice complement each other really well. 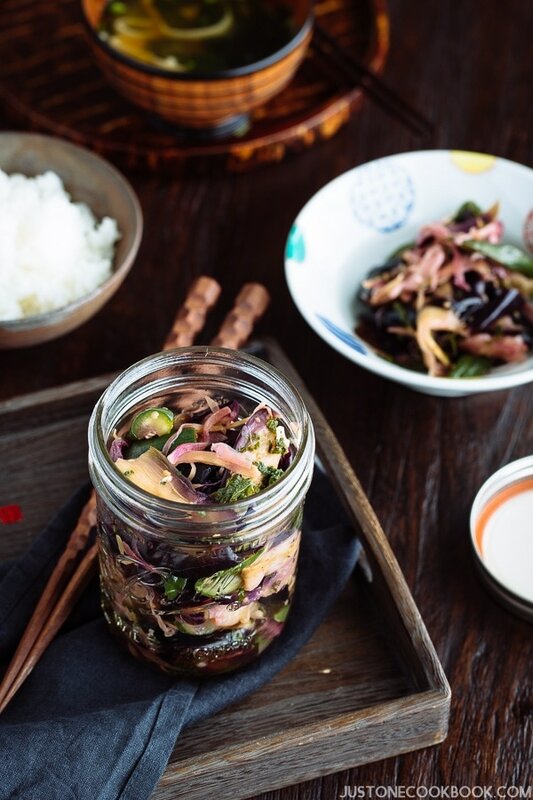 I think most non-Japanese never heard of or seen this dish before because we eat this at home rather than at a restaurant. This is one of recipes that I cook to use up the big bundle of garlic chives. Here in the U.S., garlic chives come in a big fat bundle. I don’t mind a big head of lettuce but garlic chives… I can’t eat it every single day. So if you got a bunch of garlic chives at home and not sure what to make, try this recipe! With carb, protein and fibre, it makes a perfect one bowl rice dish. Combine eggs, sake, soy sauce, salt, and black pepper in the medium bowl and mix (but do not over mix). 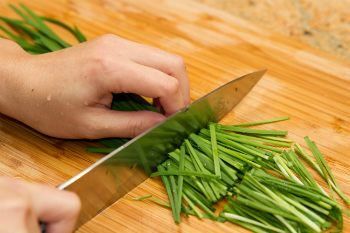 Cut the garlic chives into 2” (5 cm) pieces. Heat 1/2 Tbsp. oil in a wok over high heat and cook the bottom white part of garlic chives until wilted. Then add the green part and quickly stir fry. Transfer the garlic chives into the bowl with the egg mixture. Heat the remaining oil into the wok over high heat. When the wok is hot (smoke is coming off the wok), add the egg and garlic chive mixture into the wok. The egg mixture will get fluffy around the edges. Mix the center of the egg mixture and gently fold. When the egg is almost cooked, put rice in a serving plate/bowl and transfer the egg with garlic chives over the rice. I understand you want to use less oil as much as possible for healthy diet, but you will need enough oil to make the egg "fluffy". When the egg is added to the hot oil, egg immediately fluff up. Without oil, it may stick to the wok/pan. Please test how much oil is necessary for this dish as it depends on your cookware. Speaking of cookware, stainless steel wok/pan is recommended to use for this recipe as it is required to cook on high heat. Non-stick woks/pans are designed to use on low/medium-low heat only. If you add meat/seafood, cook it first and transfer to a plate. Put back into the wok/pan when you cook the egg and combine well. You post stirred up a memory of my parents making a dish like this for me when I was a child! Thanks for the trip down memory lane. Can’t wait to make it. 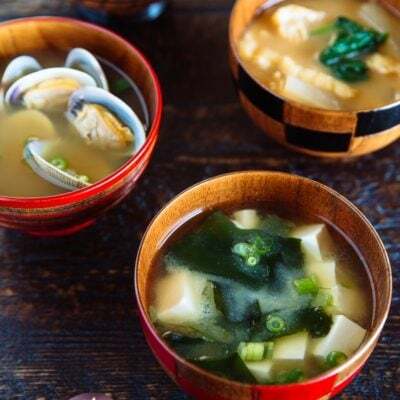 Nami: Believe it or not, I have been enjoying this dish for years! I usually but a little sesame oil in with the eggs, though. I grow my own garlic chives in a big pot (1st and 2nd years, they look like blades of grass – still edible, but small – on the 3rd year they are so well established in the pot, being perennials and very winter hardy, I just cut what I need and use); they do go dormant in the winter, so you have to freeze some which diminshes the flavor BUT, they are still quite potent! Thought you might like to know that. I love the dish and so do my friends who like eggs! Not to mention the benefits of garlic chives!! Oh, I have to try this! We grow chives in the garden every year, and always are looking for recipes that use them. This looks wonderful – thanks. I love chives with eggs and often make scrambled eggs with the addition of sour cream and chives. I know I will LOVE this dish, Nami. 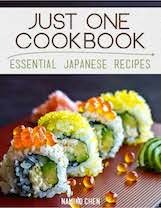 I’m making it soon. I love Chinese/garlic chives and it does go so well with eggs. Thanks for the reminder. I’ll have to make this for dinner soon! Darling Namiko-san ~ methinks very, very many people around the whole wide world enjoy this forever and again – well, I do anyways 🙂 !!!!! Chives – surely the one herb which survives our rather mild winters and which I [rather naturally] have by the bucketload at this time of the year!!! I am simple!! Just plant the plain ones and of course about three times as many garlic chived!!!! How can one even vaguely say they cook without these in the back garden 🙂 ?!!!! Lovely recipe, lovely presentation!!!!!!! Oh, this is so nostalgic for me, Nami! My father grew chives and would make himself chive omelets for breakfast! I think I’ll make this in his memory! Thank you! Easy AND quick… a delicious dinner in a very short time: great idea! I have never tired this with chives before. I have only seen it with spring onions. 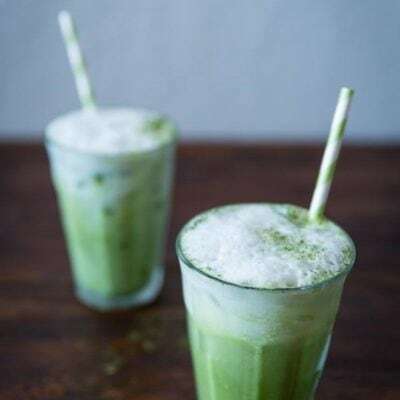 The benefits of using chives means I can get a double hit of flavor and a veggie boost! That sounds fantastic, I’m going to see if I can find some Chinese chives! Thank you for such a easy and tasty recipe. We dont have nira (Japanese kind) here. Chives are quite thin (more for garnishing). Can I use green onions instead (and add garlic as nira has garlicky taste). Thank you Helena! You too, have a nice day ! I have seriously never seen eggs look so flavorful and just utterly delicious before! I have garlic chives growing in my garden. They come up in the fall all around this area like weeds. I love, love, love them. 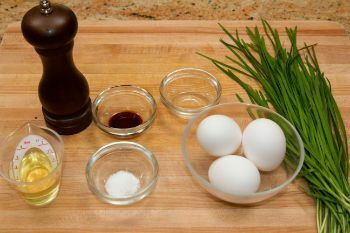 I love chives with eggs too and you can believe that I’m going to give this recipe a try. It’s already making me hungry. Hi, Nami!!! It seems that eggs and rice are something that we have in common. 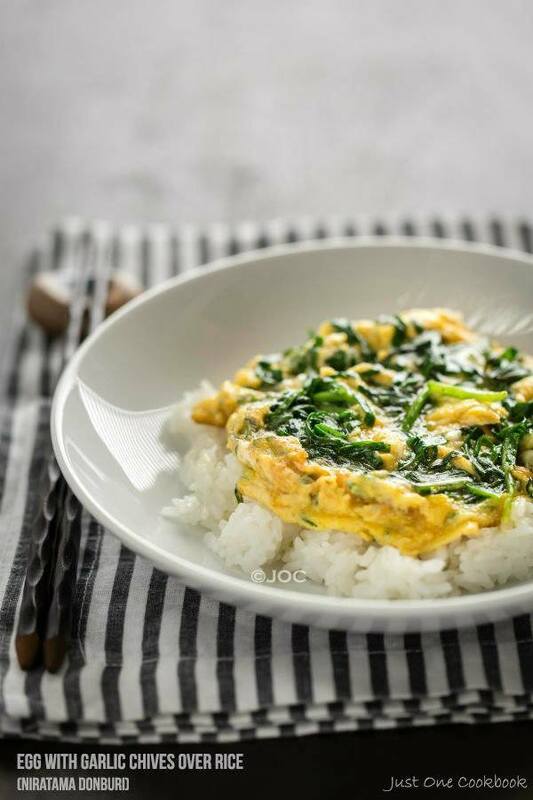 Yes, I grew up eating scrambled eggs with a creamy rice… I used to love it! In fact, it is still comfort food for me until this day. I love your dish!!!! Your children must be quite happy eating it and I bet they will have memories of it. hi Nami, We have omelette at least once a week, but never with chives – this looks really excellent. I think rice and egg are a good combination. Great recipe. Nira are a little hard to find in my area but I also make this dish using pea sprouts which also have a unique flavor to them. I really appreciate your food blog, it is a constant resource for my meals. Hi Bob! I hear some people say they grow garlic chives in their backyard (I didn’t know it was such a popular veggie to plant!) and I also hear some people like you say it’s hard to get. What an interesting ingredient! 😀 You found a great substitute and thank you so much for sharing it with us! I too have noticed that garlic chives come in gigantic bunches. 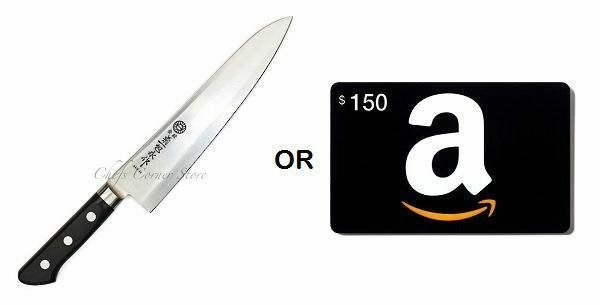 I never know what to do with them, so I just don’t buy them as often as I’d like! But this looks like an excellent way to eat a whole big handful in one fell swoop. 🙂 Delicious! It may be just a simple egg dish but I fell in love with it at the first pic. it really looks so delicious and the garlic chives sound really great to me. This would make a great meal and no I never heard of this dish before. Only one word – bookmarked!! I am going to hunt garlic chives tomorrow!! Mmm…looks yummy! This dish looks like something my dad has made at home. I believe the chinese characters are 大蒜韭菜 (garlic chive)? Hi Candice! I’m not sure how to write in Chinese character. Japanese uses “katakana” or “hiragana” characters for garlic chives (we write ニラ or にら) and no kanji at all. 🙁 Thank you for your kind compliment! I love eggs and this looks and sounds delicious! I have never heard of garlic chives either–I’ll need to go find that. This is so simple and would be great for a quick dinner after work. Can’t wait to try this! 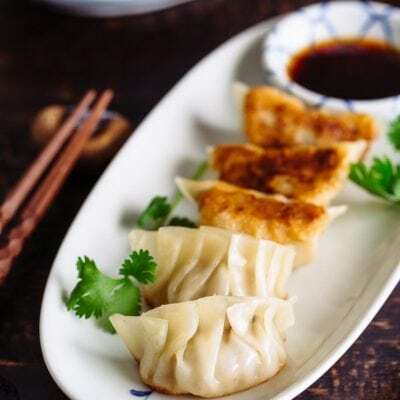 I love this recipe, Nami! So simple and comforting…just like all of your recipes ;). Your children have much to look forward to after school! I’m on the lookout for these garlic chives/Chinese chives, Nami. I’m intrigued by what the flavor must be like. 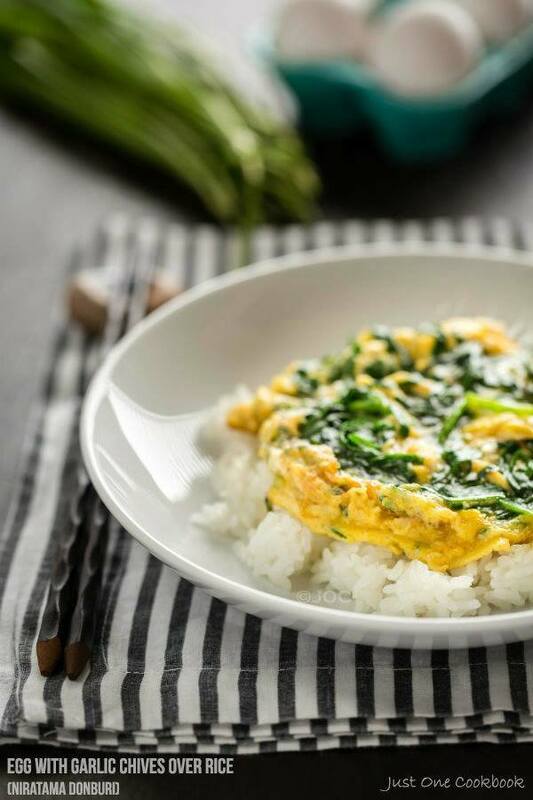 Delicious looking egg dish over rice – could eat for any meal of the day. This recipe is also good using Ramsons (aka Allium ursinum or wild garlic – not as strong taste as garlic) in place of the chives. This dish looks perfect for a quick and delicious lunch! I love eggs, so I know we would enjoy it a lot. I would not even think twice about diving into these gorgeous eggs over rice! It looks like comfort food to me, Nami 🙂 Have a fantastic weekend! This is one of my mother’s go to dishes on a busy day. I don’t know if it ever had a name -we just called it fried egg haha! 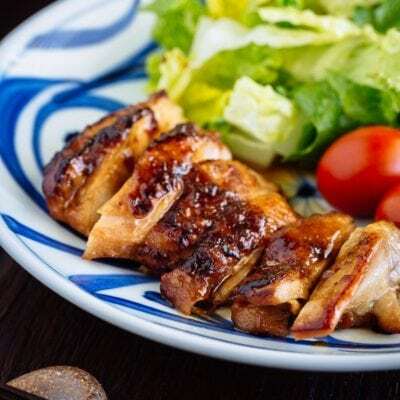 Nami-san, this is a great budget friendly dish. I have 3 dozen eggs in my refrigerator so this recipe came with perfect timing. Wishing you a super weekend. I use chives quite often in my kitchen but have never tried garlic chives. Sounds very interesting and tasty. I’ve never heard of garlic chives before but I want to try them. We don’t eat as much rice as we used to but I would love this dish and so would the Mr. Thanks for sharing this lovely homecooked Japanese rice, I will definitely make it! This looks healthy and delicious, Nami. A very unique breakfast dish for sure. It looks and sounds so delicately balanced. Beautiful post. 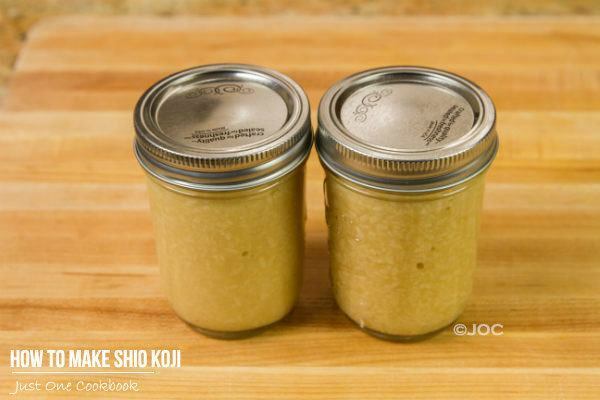 Made this for the first time today and, unfortunately had to make a few substitutions (white wine instead of sake…. chives & garlic instead of garlic chives) and OMG!! It was really good! I can’t wait to hunt down the garlic chives and make the recipe properly! Hi April! I’m so happy you liked it! 😀 Thank you for trying this recipe! This is a perfect lunch for Bobby and I! Whenever I have leftover rice, I usually cook up a fried rice dish using stuff in the fridge, so egg with rice – perfect. Now I just need to find some garlic chives. I use to grow them and was planning on growing them again this year. Great recipe Nami! Thanks! 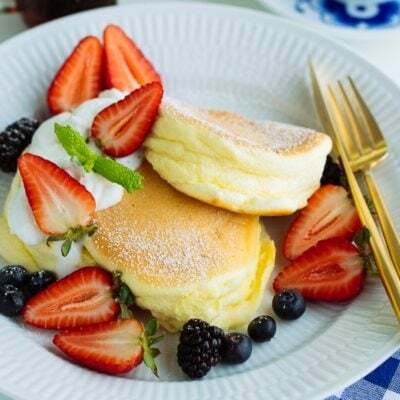 Such a wonderful – and may I call it also- frugal dish. It is new, delicious, frugal and easy … I have never heard of garlic chives so from where can I get it? Korean market? if I cannot get it what would you recommend for an alternatives to get the wonderful taste and aroma? I love when my husband likes what I cook, and most if he asked to repeat…isn’t it great??!!! 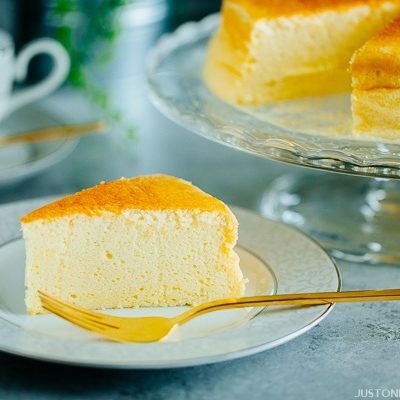 What a simple and delicious recipe! It just goes to show, I really have no excuse to ever resort to takeaway food, there are so many simple and quick recipes. I am pinning this. How unusual to combine a sort of omelet with rice. Must be a very unexpected mix of flavors. I would love to try it! Kids love eggs! I like that this recipe is so easy to do and yet results in a tasty dish. 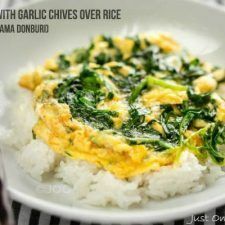 I love add chilli and garlic chives for my omelette, but never stir fry the garlic chives first…. Dear Nami, now I finally know what to use the garlic chives in. 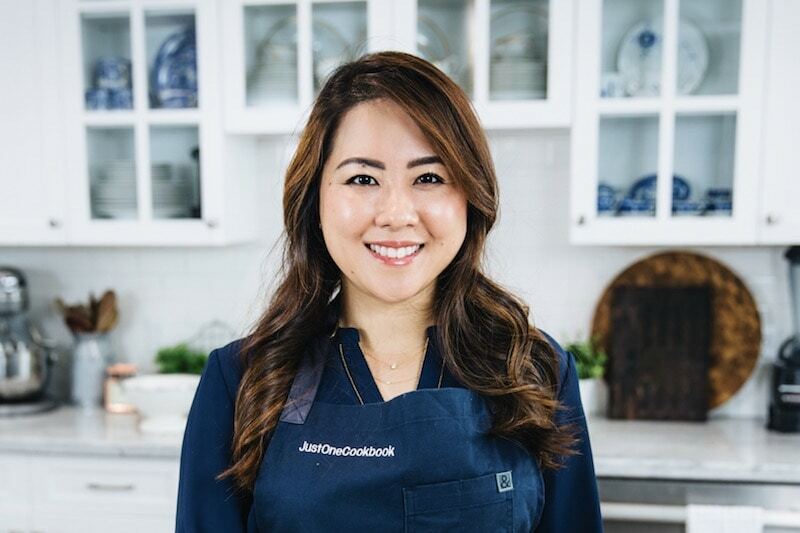 I have seen them and looked at them quite a few times at my favorite Asian market but up to now, I never knew what to use them for – thanks for providing this lovely yet simple recipe and for teaching me yet again another wonderful dish to prepare for the family! I’m definitely going to try this! I wish I knew about this dish earlier so I could eat it after school as well! Haha! Anything with eggs are delicious! I am a stay-at-home struggling to feed my family good home cooked meals (especially my picky toddler who only eats Asian food). I’m so thankful to have stumbled upon your blog. I love this recipe in particular. 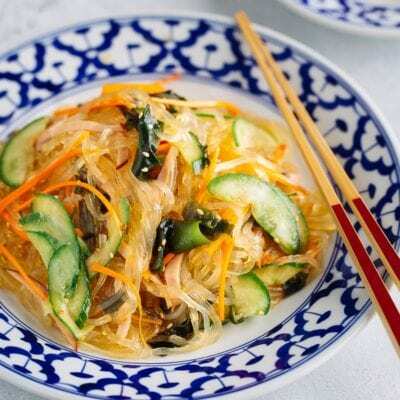 I usually make a morning omlete w/ green onion and thinly sliced zucchini or squash over rice. After reading your recipe I switched to chives and added soy sauce and mirin (at the moment we don’t have sake in the house). There are definitely new flavors that shines! 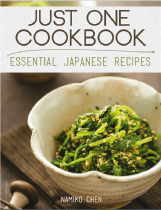 Your site has become a wonderful reference to Japanese/Asian cooking. Thank you! Usually chinese will cook ‘oyster omelette’ with chives. It is simply just oysters+egg+chives+salt+msg+pepper. It is available everywhere in Singapore hawker centres. But I have never tried your recipe before and I can already smell it. I will definitely try to cook your egg+rice as I believe yours is a super healthy version. My garlic chives plant was getting a little tall and this was the perfect use for them. Such a quick and delicious breakfast for my family! This looks delish, but this chives looks exactly the same like the one we have in Austria (as in regular chives9? 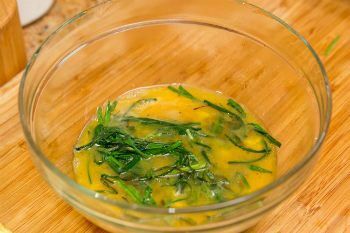 You can also cut and freeze the chives perfectly – to sprinkle over egg dishes to your heart’s content whenever you like. Just as good as fresh …Love chives and eggs in any combination. Lunch for tomorrow sorted 🙂 thanks ! 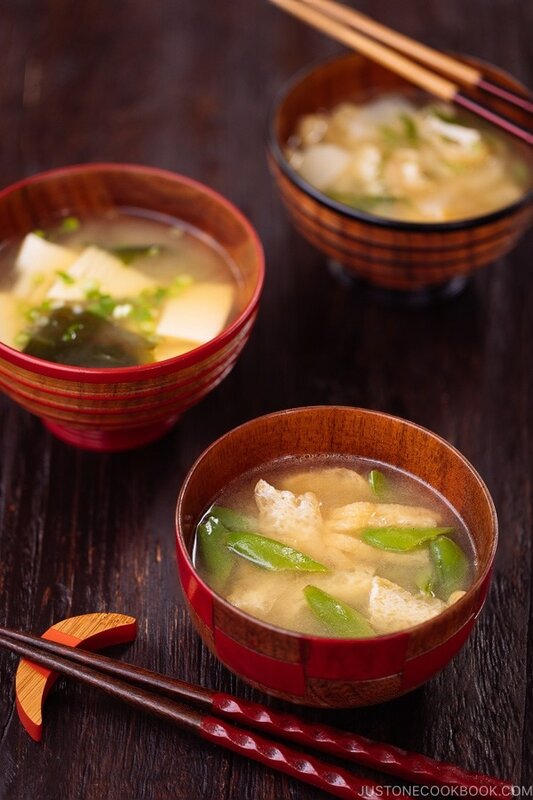 I absolutely love getting these simple but tasty “home cooking” recipes, Nami! Keep ’em coming, please!! what kind of pan did you use? is it a wok? what’s the brand name? tnx. thanks! i’ll check that one out and see if it works ok with electric stove since pan takes forever to heat up. A staple in my house now. Thank you, just delicious and so simple! I made this with regular chives and it was still delicious. Add some toast. (Okay I admit I was too lazy to make rice and wanted toast anyways). Such a yummy anytime simple meal.